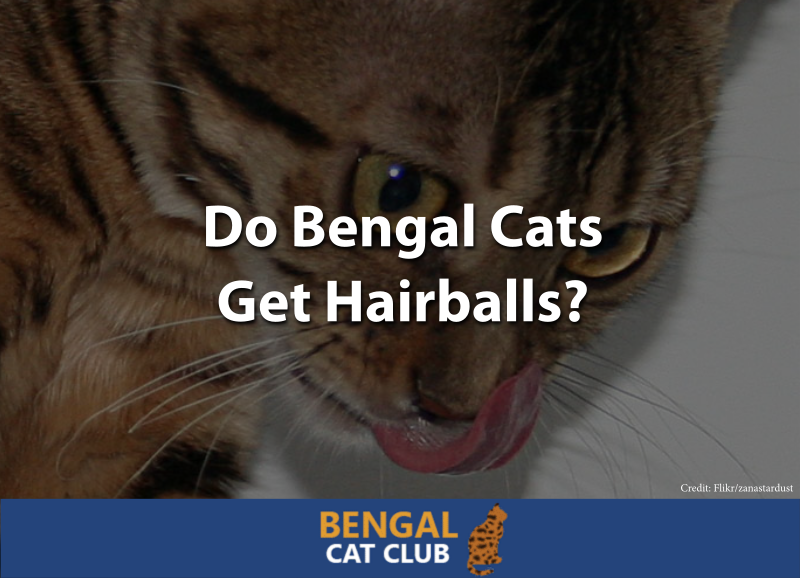 » Do Bengal Cats Get Hairballs? There are many types of cats that get hairballs, but do Bengal cats get hairballs? It’s important to know because of the way it can affect the health of your cat. Although hairballs are most common in cats with long hair, any cat (including Bengals!) can get hairballs. Do Bengal Kittens Get Hairballs? Before we get into whether or not Bengal cats can get hairballs, let’s look into exactly what hairballs are and then how they’re formed. Hairballs are simply balls of hair that form in a cat’s stomach which are then vomited up. It’s not pretty, but it’s common in cats since they frequently self-groom. It’s also important that they do vomit up the hairball because otherwise these masses can get stuck in their digestive tract and cause problems. If you have a cat that gets hairballs and you notice they aren’t defecating and it seems like they’re in pain, take them to the vet right away! As you probably already guessed, hairballs form when a Bengal cat cleans itself and the hair gets trapped in the stomach. Most of the time, these small amounts of hair pass harmlessly through the cat’s digestive tract. However, sometimes there is an excess of hair or the hair simply gets tangled on itself and stays in the stomach, gathering more hair. After a while, the cat rids itself of this hairball by throwing it up. Hairballs form naturally and are not dangerous to the cat as long as they come back up the way they’re supposed to. Although long-haired cats are far more likely to get hairballs because it’s easier for their long strands of fur to get caught on one another, it is also possible for Bengal cats to get hairballs. If your Bengal cat cleans itself excessively, then it’s more likely to end up getting hairballs because it will be ingesting more if its own hair. If your Bengal cat grooms other cats in the house, especially any long-haired cats, then it’s even more likely to end up with hairballs since there’s more hair going in. However, for the most part, Bengal cat owners don’t have to worry about cleaning up a soggy hairball since most Bengal cats don’t get hairballs. Their hair is short, and they’re not known to be excessive self-cleaners (which is what makes them hypoallergenic), so they’re not likely to end up with hairballs. Since Bengal kittens shed like adult Bengals, they can also get hairballs while grooming themselves as they can accidentally swallow loose fur. However, Bengal kittens are far less likely than adult cats to end up with hairballs because they tend to not groom themselves as often as adults. This is because kittens consider playing, sleeping, and eating to be far more important than grooming. Very young Bengal kittens are also not as likely to get hairballs as adults because they’re typically groomed by their mother. That means that the mother cat is the one that is picking up any extra fur that her kittens are shedding while she works to keep them clean. Like adult cats, if a Bengal kitten does get a hairball, it will hopefully come up as vomit the way it’s supposed to. Since kittens are more vulnerable, you need to take them to the vet as soon as you suspect that something is wrong since a simple problem like a hairball that’s not coming up can quickly become life-threatening to a tiny kitten. If you are worried about your Bengal cat or kitten getting hairballs, there are some things that you can do to prevent hairballs. Even if you’re not too worried about it, none of these things are harmful and most will still improve their overall health even if they don’t need them done for hairball prevention. The first way you can prevent hairballs in Bengal cats is to groom them frequently. Since Bengal cats have short fur that doesn’t get tangled, once a week is all you really need to keep their coats in good condition and to help prevent hairballs. This prevents hairballs from forming because it gets a lot of the loose fur off of your Bengal before they have the chance to lick it off themselves. It’s especially important to groom your Bengal regularly during the spring and fall when they are shedding the most. In the spring, Bengals shed their winter coat in preparation for the hot summer months. In the fall, they shed their summer coat to grow in their winter coat for the cold months. There are many brushes available, so you can pick any of these that are the best brushes for Bengals that can help your Bengal feel great and avoid getting uncomfortable hairballs. Unlike most cats, Bengals LOVE water! That means it’s easy to give them a bath. A bath works like brushing as it removes loose fur so they don’t remove it from themselves and end up with hairballs. To bath a Bengal cat, you’ll need special cat shampoo. This is because cats have sensitive skin that gets dried out easily, but this shampoo will prevent that from happening. If your Bengal is one of the few that don’t like water, you can also find waterless cat shampoo that will also work to keep them clean. Be careful when using any supplement with your Bengal as you want to make sure it’s not negatively affecting them. These supplements are generally considered safe, but you should talk to your vet if you have any concerns about giving them to your Bengal. Laxatone helps to loosen up the hair that your cat has already swallowed to encourage it to pass through your cat’s system instead of forming hairballs. It’s considered safe, and can be given daily to prevent hairballs, but you can probably get away with giving it just once per week. BLUE Buffalo Indoor Hairball Control is a food that’s designed specifically to help prevent hairballs in cats. It’s also grain-free and contains real meats that your cat can derive all of their nutrients from so that there’s no need for them to eat anything else! So, do Bengal cats get hairballs? They can, but generally don’t. But if you do have a Bengal cat who gets hairballs, there are several things that you can do to make sure the problem stays under control, whether you decide to brush them, bathe them, or give them a supplement. What about you? Has your Bengal cat ever gotten a hairball? We’d love to hear your story, so leave us a comment below!